HEAVY LOAD: Rosa Ciunci, left, and Maureen Pagliaro, co-founders of LinenDrops.com, provide linen services for vacation and short-term rental properties throughout the region. After working in criminal justice, Maureen Pagliaro was looking for something different to work on. Inspiration came during her vacations in North Carolina when she noticed all the linen services in the area – something Northeast coastal towns were missing. “I thought it would be a niche here,” Pagliaro said. Turns out, she was right. With her idea, Pagliaro started ­LinenDrops.com in 2017 after teaming up with co-founder Rosa Ciunci, who had some experience in the hospitality industry, and conducting site visits to a few of North Carolina’s linen services. 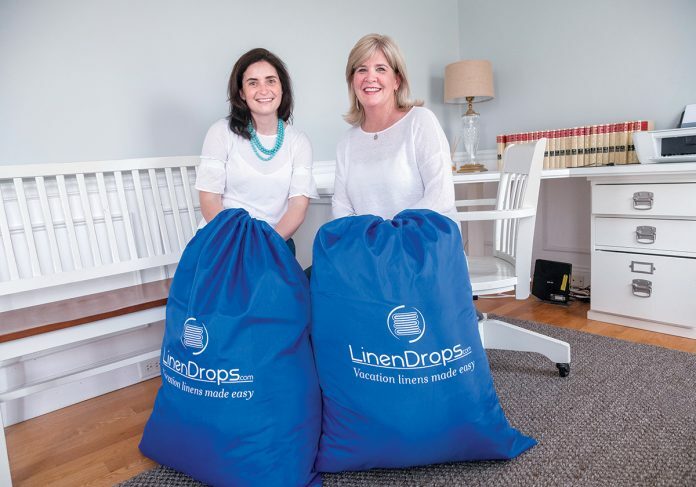 The East Greenwich-based linen-delivery service offers pickup and drop-off for linens, such as bed sheets and towels. After ordering linens online, LinenDrops delivers to the client’s property. After the linens are used, LinenDrops picks up the linens and handles laundry. Though Pagliaro and Ciunci are the only full-time employees at LinenDrops.com, they set up a system that allows for the service to run smoothly. Linens are stored at warehouses in Rhode Island and on Nantucket and Cape Cod, independent drivers complete the pickups and deliveries, and the dirty laundry is sent to a laundry facility for processing. At the warehouse, Pagliaro and Ciunci keep strict inventory to make sure the linens are fresh. In managing the business, Pagliaro focuses on the sales side of LinenDrops, managing outreach, conducting door-to-door marketing and working with the linen vendors. Ciunci focuses on operations for the warehouses and trains the part-time staff that comes in to help during the busy summer months. Homeowners and vacation rentals were LinenDrops’ target market when the company started. Pagliaro and Ciunci made connections with local Realtors and created email marketing and social media campaigns to help get the word out. Over time, the company has developed relationships with clients on Cape Cod and Nantucket, as well as the Rhode Island and Connecticut shoreline. Pagliaro and Ciunci imagined the quality and convenience in their product would help them build a strong customer base in market segments beyond vacation rentals and homes. The company announced in April that it will be expanding into colleges, summer camps and short-term corporate housing. Moving forward, Pagliaro hopes the company can expand its service area and seek more opportunities with shipping services. “It’s been a surprisingly fun process to learn the whole ropes and start something from the bottom up and get it moving,” Pagliaro said.